I think it is worth mentioning that despite Thomas Verstraeten’s doubts, and the negative findings of Elizabeth Miller’s study (Andrews et al), autism incidence did in fact leap in the UK at the time of the introduction of the accelerated schedule in 1990 – when administration of DPT was brought forward from 3, 5 and 10 months to 2, 3 and 4 months. Indeed, in North London it more than doubled. 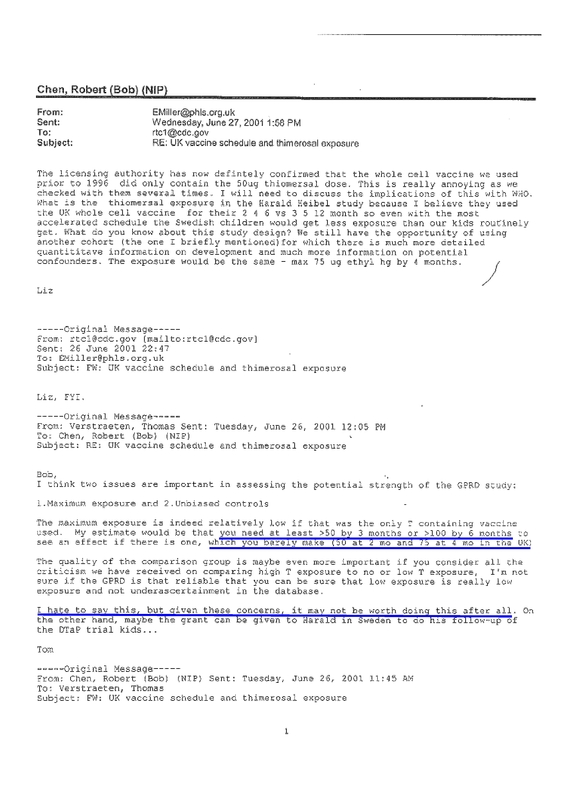 One thing to bear in mind is that exposure may have been higher in the vaccine than the 50 micrograms stated in the study – several government documents circulating in 1999-2001 suggest it was double the given amount, something later denied but without any explanation. Also, at that period the schedule may have been administered partially and in separate shots, according to parental wishes (or possibly stock availability) and the separate shots could each have 25 micrograms of mercury. 4 separate shots by 3 months would cross Verstraeten’s threshold. To clarify further, the quality of data in the UK study (Andrews et al) from the General Practitioners Research Database – as Verstraeten also warned in his email before the event – was too poor to obtain meaningful results. Indeed, apart from inadequate vaccine records they were only able to identify autism at a rate of just over 1 in 1,000 when according national statistics there was an incidence of 1 in 100 over the period. As with the Tozzi study many of the vulnerable cases were also filtered out before arriving at its conclusions. The conduct of this study should also be the subject of a public investigation. Thanks for the great post, very important information. thank you for this clear information and the details on the bias of the false study. AUSTRALIA: Australia has one of the highest allergic incidence rates in the developed world. GERMANY: The prevalence in children is 3 percent to 6 percent, but can be up to 30 percent in high-risk groups, such as children with eczema. ITALY: An estimated 6 to 8% of the Italian population has food allergies. JAPAN: about 7% of population had some form of food allergy. MALAYSIA: about 30% of young children are likely to develop allergic disorders in the first five years of life. SWEDEN: one out of 15 children with reported adverse reactions to food. US: One in every 17 children under the age of 3 has food allergy. So is this epidemic of food allergies mostly among young children caused by being too clean (hygiene theory – food allergies are unknown in undeveloped countries) in the last 5 years or something else? 2007 – Children are now to receive 48 doses of 14 vaccines by age six and 53-56 doses of 15 or 16 vaccines by age 12. Vaccines contain an adjuvant that increases the body’s immune response to the protein in the vaccine. Something that the public and most physicians don’t realize is that the adjuvant can also contain a mixture of vegetable and animal oils that have a trace of food protein in them. This is a protected trade secret and does not have to appear on the package insert. The ingredients of many adjuvants can only be found by reading patents. What are these oils? Soy, sesame, peanut, wheat germ, corn, shellfish, fish, etc. Can a trace amount of food protein in a vaccine cause food allergy? Yes. This has been known since 1839, when the French physiologist Francois Magendie injected animals to create a food allergy to egg whites. The food industry has to label food that may contain trace amounts of peanuts or nuts but the pharmaceutical industry is exempt. Vaccines are food allergy roulette! Before they’re done, they’ll have us sensitized to everything under the sun. But then, they have drugs to respond to these conditions; what are we complaining about? Oh, the periodic anaphylactic death? Well; that’s collateral damage for you…happens all the time…….,get with the PLAN, man. Or we’ll obsolete you too.